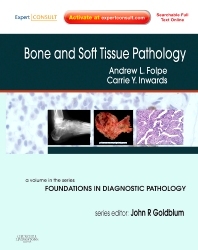 Bone and Soft Tissue Pathology: A Volume in the Diagnostic Pathology Series, by Andrew L. Folpe, MD and Carrie Y. Inwards, MD, packs today's most essential bone and soft tissue pathology know-how into a compact, high-yield format! The book's pragmatic, well-organized approach—complemented by abundant full-color, high-quality illustrations and at-a-glance tables—makes it easy to access the information you need to quickly and accurately identify pathology specimens. Best of all, Expert Consult functionality provides online access to the full text of the book, downloadable illustrations for your personal use, and more. The result is a practical, affordable reference for study and review as well as for everyday clinical practice. Includes access to the complete contents online, fully searchable, downloadable illustrations for your personal use, and more, allowing you to consult the text a quick, convenient manner. Reviews normal histology before examining abnormal findings, enabling you to conveniently compare their characteristics in one place at one time. Covers both neoplastic and non-neoplastic conditions of bone and soft tissue to equip you to meet a wide range of diagnostic challenges. Uses a consistent, user-friendly format to explore each entity's clinical features, pathologic features (gross and microscopic), ancillary studies, differential diagnoses, and prognostic and therapeutic considerations...making it easy to locate specific information on a particular entity. Features abundant boxes and tables throughout that enhance the presentation and accessibility of the material. Offers nearly 1,000 full-color, high-quality illustrations that demonstrate the key features of a wide variety of pathologic lesions to facilitate greater accuracy in identification of specimens.